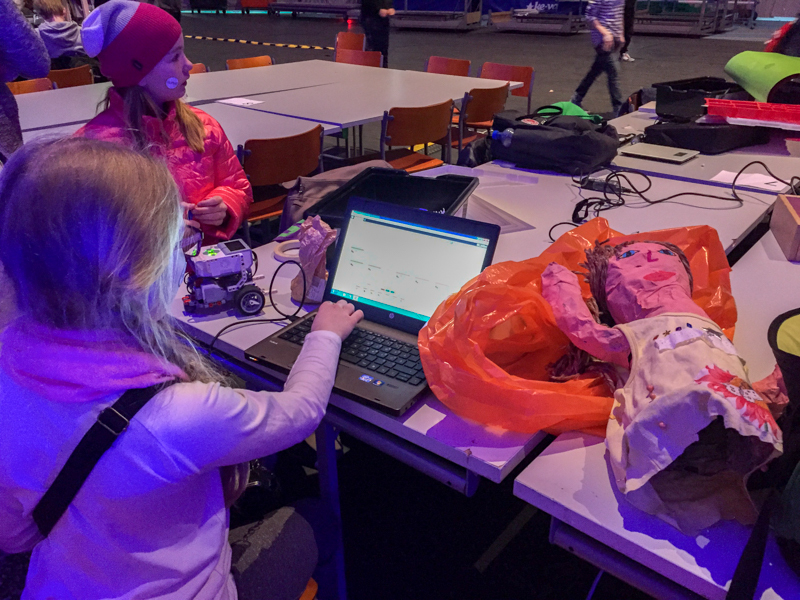 I had the opportunity to tag along with a busload of primary school students for a three-day trip to attend SciFest in Joensuu. 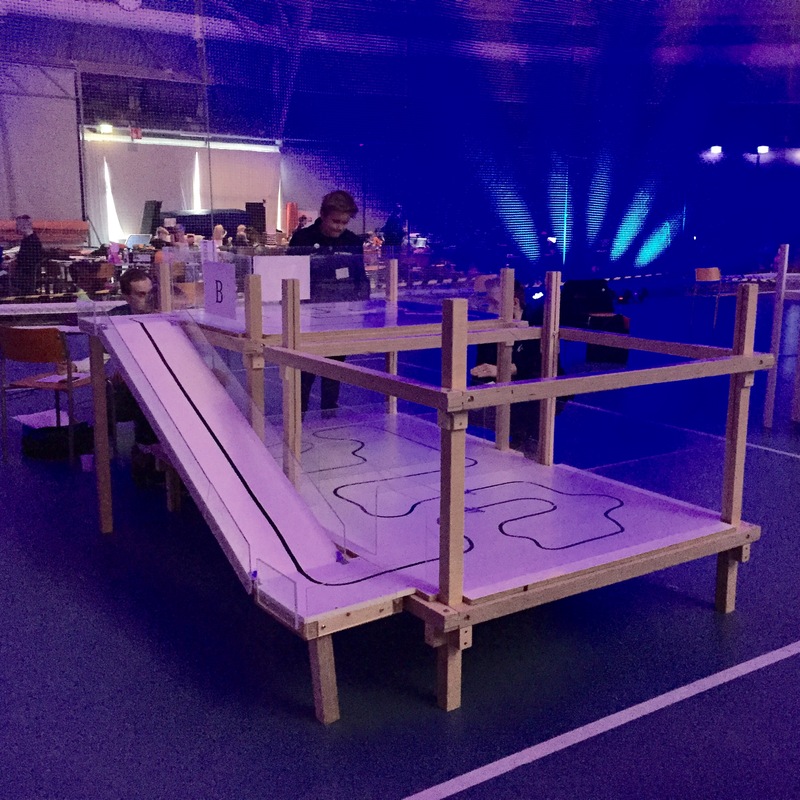 The students, from Koulumestari and Vanttila schools, were attending the festival to compete in the RoboCup Junior Finnish Nationals. 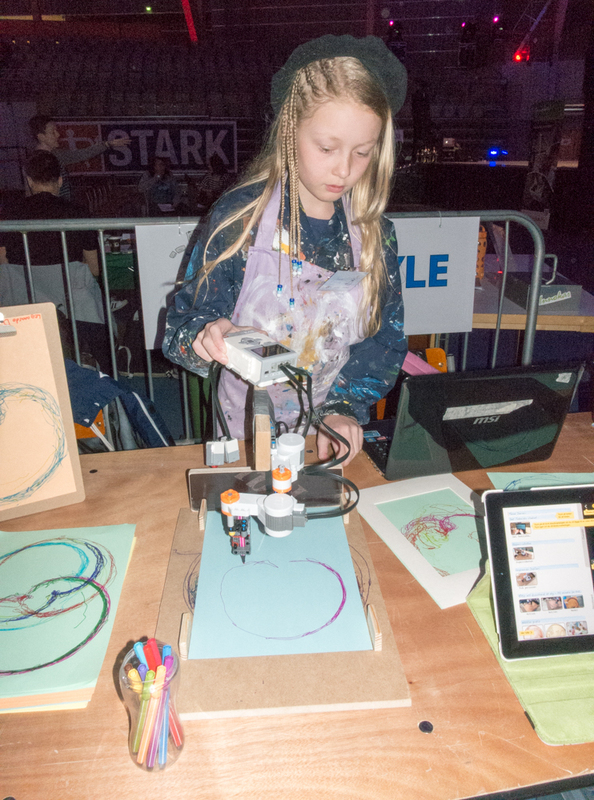 SciFest is a yearly festival that features activities and workshops for students and teachers. This year the festival celebrated the UNESCO International Year of Light. While this made for some interesting activities and displays, it also meant that the building was too dimly lit for easy photo taking! The festival included many booths with activities on topics such as computer programming, 3D printing, color mixing, light bulbs, lenses, colorblindness, and environmental issues. Many of the booths were run by students, ranging from university graduate students to those in middle school. 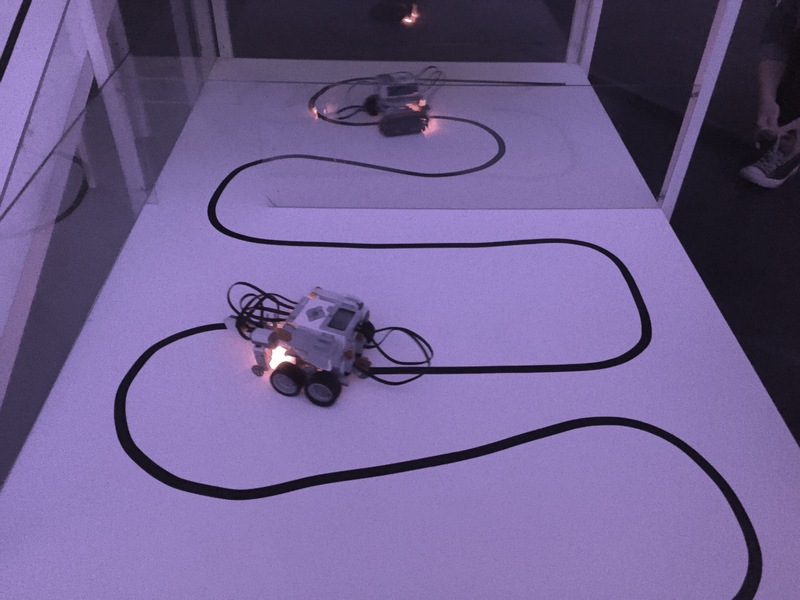 The RoboCup event included five different types of competitions. Some were more traditional events such as Soccer and Sumo Wrestling. Two others highlighted students’ creativity. 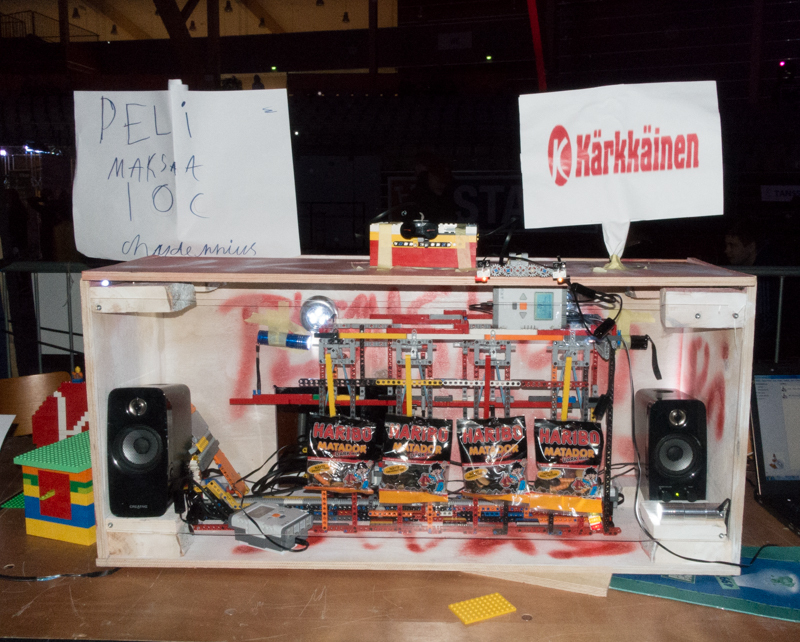 One was the Freestyle competition in which students had to design a robot to achieve some type of useful task. My three favorites Freestyle entries are shown below. The robot creates artwork that’s for sale. To play this game, you deposit a coin in the machine and then stop a moving lever at the right instant to win a bag of liqorice. 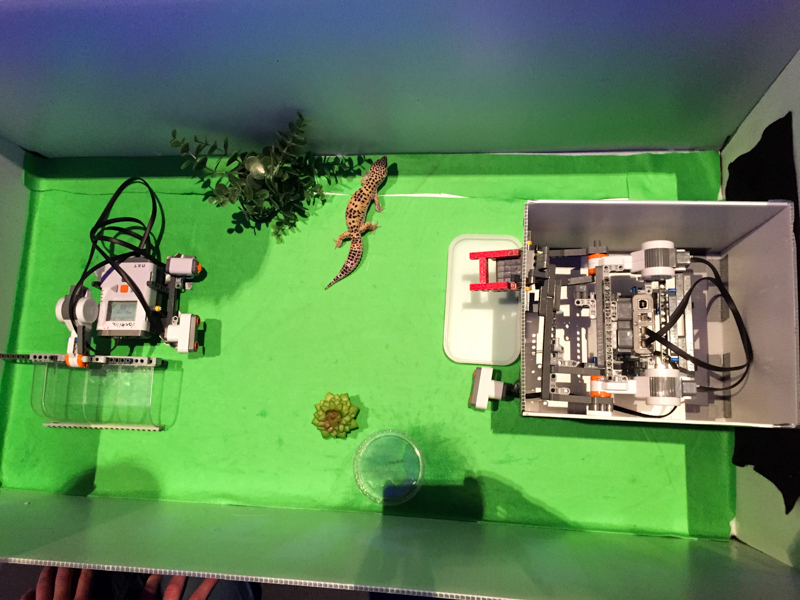 This machine automatically feeds your pet lizard if you’re out of town. While attending the festival was the purpose of the trip, it was only part of the fun for the students. We traveled six hours by bus and camped out in a local school with more than 200 students from all over Finland. The boys all slept in the gym, and the girls stayed in classrooms. In the evening, the students had the run of the building. They played in the gym or in the hallways of the school that featured a giant chess set, pool and ping-pong tables, and video games. Breakfast and dinner were eaten in the school cafeteria. This way of traveling makes so much sense, yet I’ve never heard of students doing this in the US. Fun times! This entry was posted in Uncategorized on June 14, 2015 by Travel Stitcher. 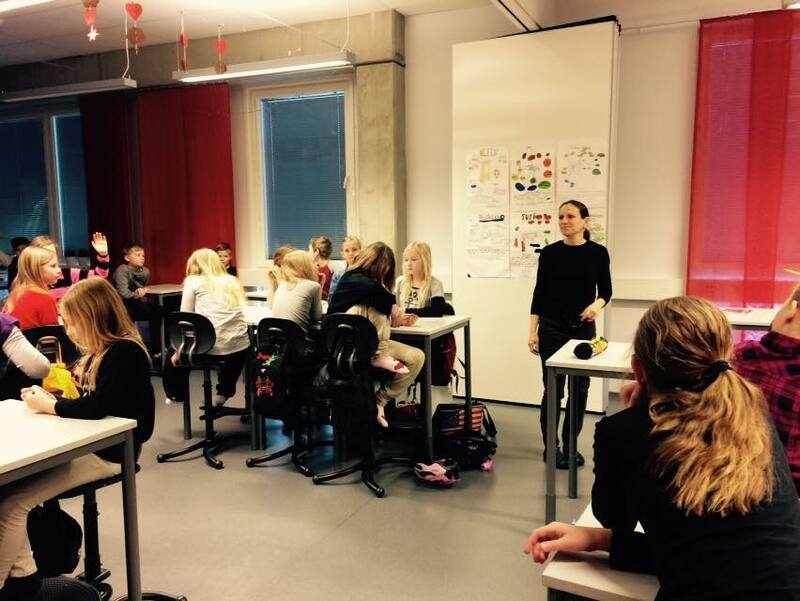 I’m an American teacher who spent four months in Finland visiting schools, including many in the Innokas Network. 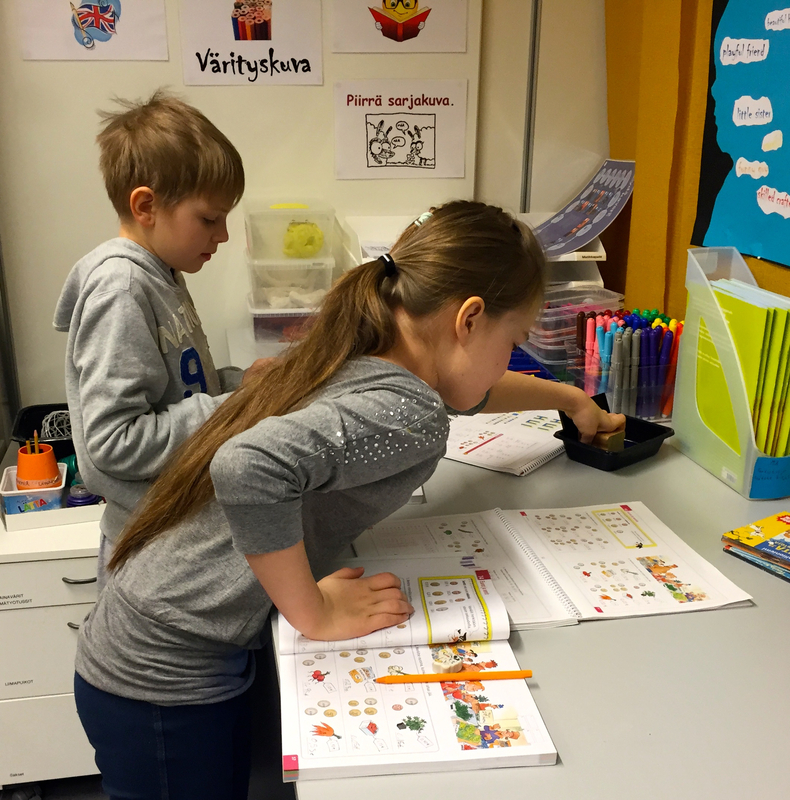 The Metsokangas School in Oulu, which educates 800 students in grades 1 through 9, is similar to my own school in that it is facing an increase in enrollment. Metosokangas started with one building, expanded to two, and is now building a third. I spent two days touring the facilities, observing classes, and talking with the vice headmaster about the creative expansion plans. I spoke to a few classes about school and life in the US, and then the students practiced their English by asking me questions they had prepared in advance. My favorite was whether I had visited Springfield, home of the Simpsons. Students start studying English in 3rd grade, and I was impressed by how well the 4th graders could speak. They put me to shame when comparing my Finnish to their English! The photos above show two classes that share one large room, something that is done by quite a number of classes in the school. Teachers are given the freedom to choose how to organize their classes, and some choose to combine groups from the same grade level, while others have separate classes. Partly this choice is decided by logistics; not all rooms can be combined into a larger space. And some teachers prefer to work alone with a smaller group. The fact that teachers are given the freedom to teach the way that works for them and their students is evidence of the trust given to Finnish teachers. Students in the combined groups sometimes have lessons as one large class with two teachers (and possibly also an assistant), and at other times the classes split into two. This is an efficient way of working, especially when students are being given direct instruction or a project is being explained. Students can then do individual or group work while both teachers circulate. I suppose it wouldn’t work so well in a lesson that required students to be answering questions, as each student would have fewer chances to participate. I also saw a combined group of second graders that included a mainstream class and a special education class of students with significant needs. This is the second year that the same students and teachers are together. While I visited, students were studying money and the class was divided into two groups. On one side of the room, the large group was working with decimals. On the other side, a small group was taught by a special education teacher and an assistant; they were learning about different coins, and students were practicing going up the the cash register and buying stuffed animals in a store. Some of the special education students have math lessons with the larger group, while others are always in the small group. I love how the teachers were able to find ways to have students work on learning similar material but in differentiated ways. 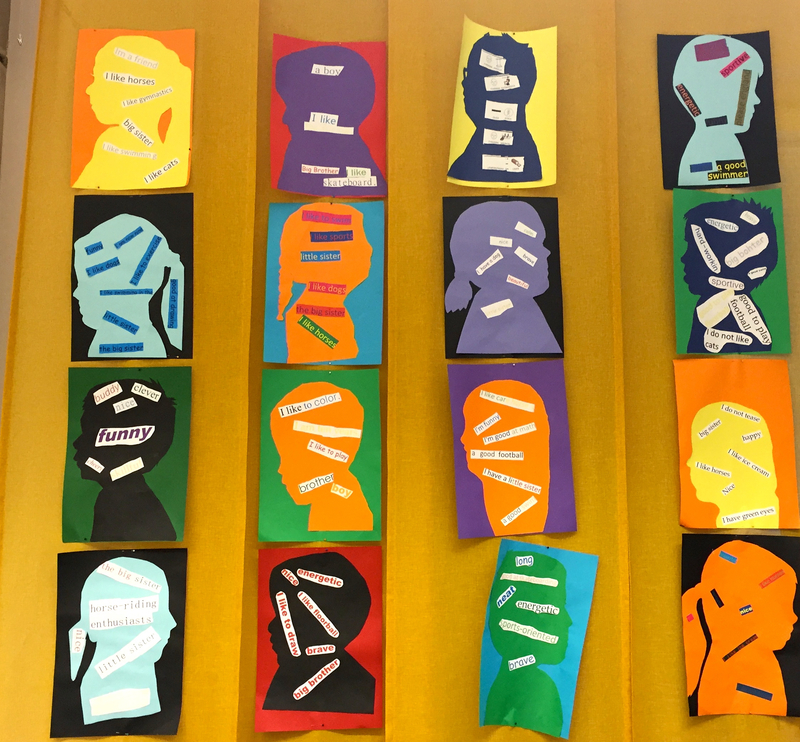 Early in the year, students cut out their profiles and decorated them with descriptors of their personalities and hobbies (see below). For most of the students, the goal was to practice using English words. But the assignment was different for the student in the top row, second from the right. He is still working on learning vocabulary in Finnish, so his profile was decorated with Finnish words and accompanying pictures. When I asked how the arrangement of joining classes came about, the teachers said they though it would be a good idea that would benefit all of the students, so they decided to try it. I love how teachers here are given so much freedom to implement new methods. 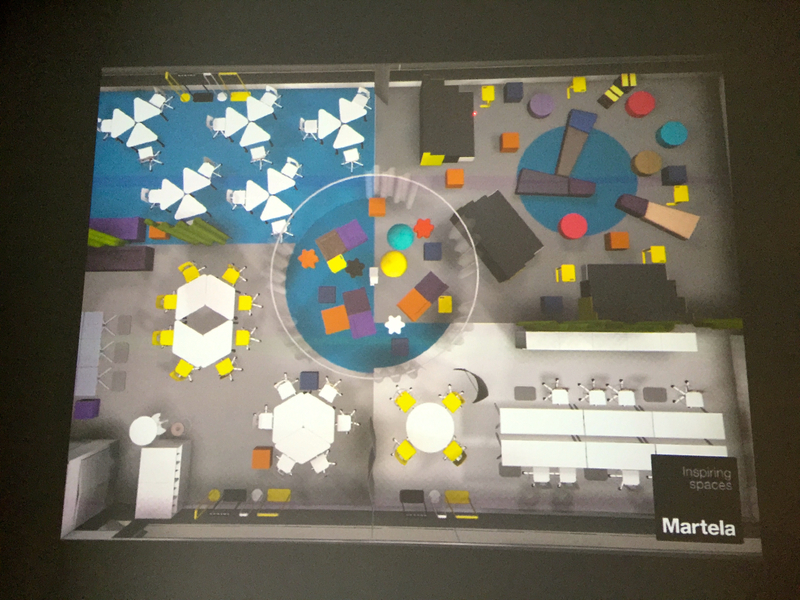 The combined-class model is being incorporated into the design of a new building that is being constructed adjacent to the two buildings on the campus. The building will house 400 third and fourth grade students. Rather than constructing smaller individual classrooms, the school will contain very large rooms that accommodate 70-80 students and four teachers. The space will contain one quadrant with a hard floor, useful for art class and science experiments that may be messy. 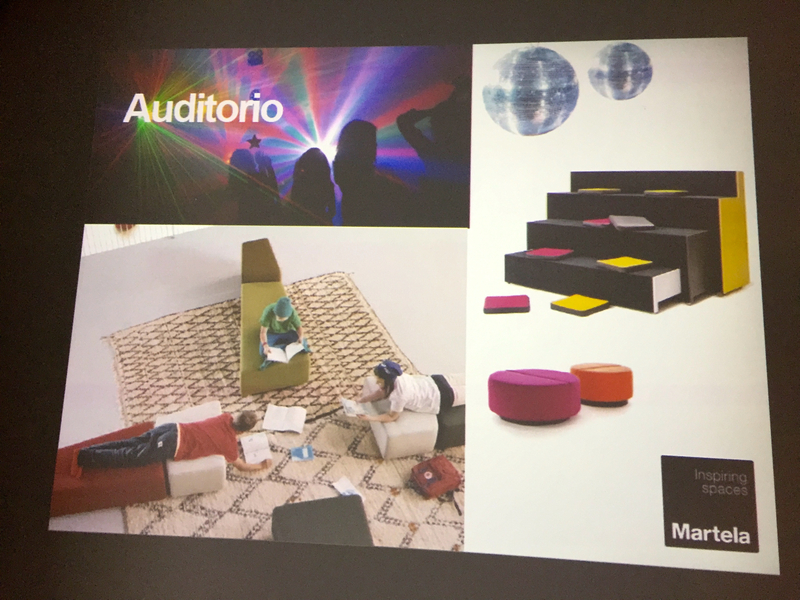 The rest will have sound-absorbing carpet and will have an area for gathering all of the students on soft furniture and collapsible stadium-type seating. The center will have a reading area with privacy provided by movable half-height walls. 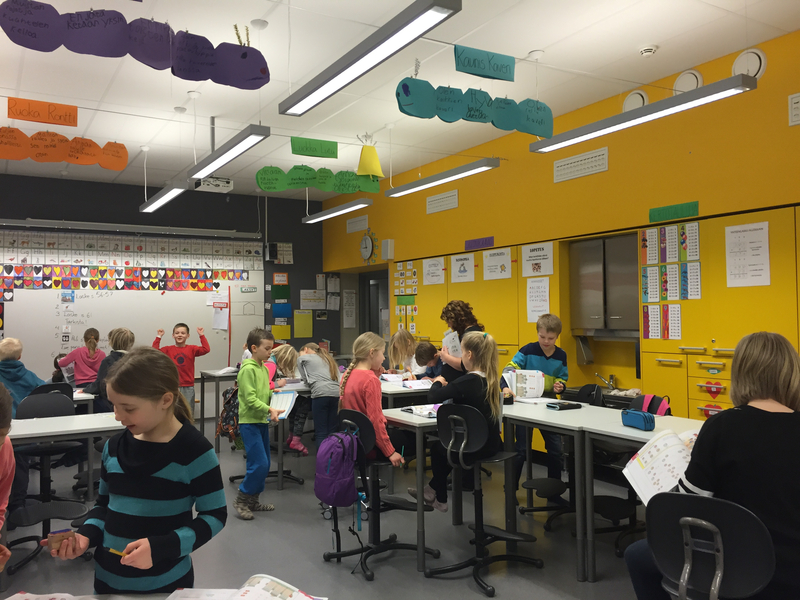 I’ve noticed many creative uses of space in Finnish schools. The hallways are not simply spaces through which students move from class to class that sit vacant when classes are in session. They are usually filled with tables and chairs, beanbag chairs, and computer workstations. This makes it easy for students working together on a group project to find a space of their own or for a student to read or work independently without distractions. 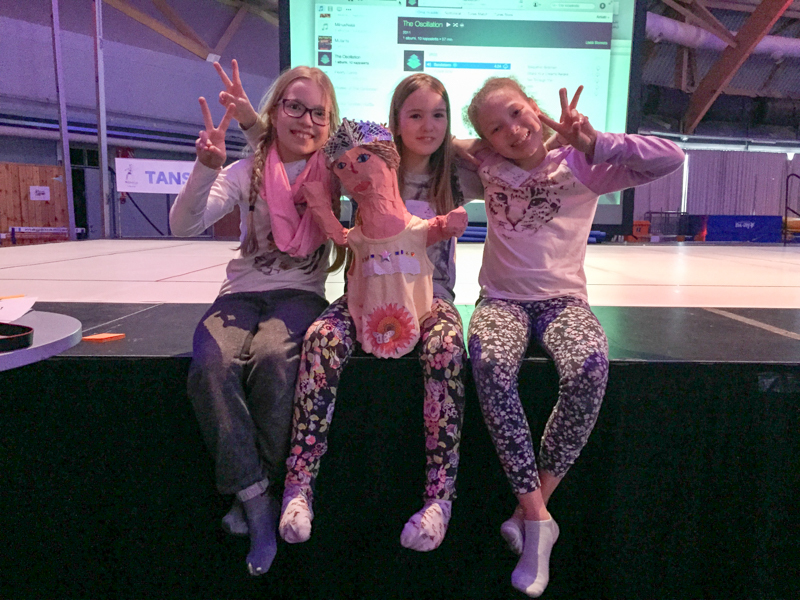 You can see more of the Metsokangas school and a product of the students’ hard work in this music video they created. The tune is catchy and will stick in your head for ages! I am an American science teacher spending four months in Finland on a Fulbright grant. I’ve been visiting many Innokas schools and was asked to share some posts from my own blog. 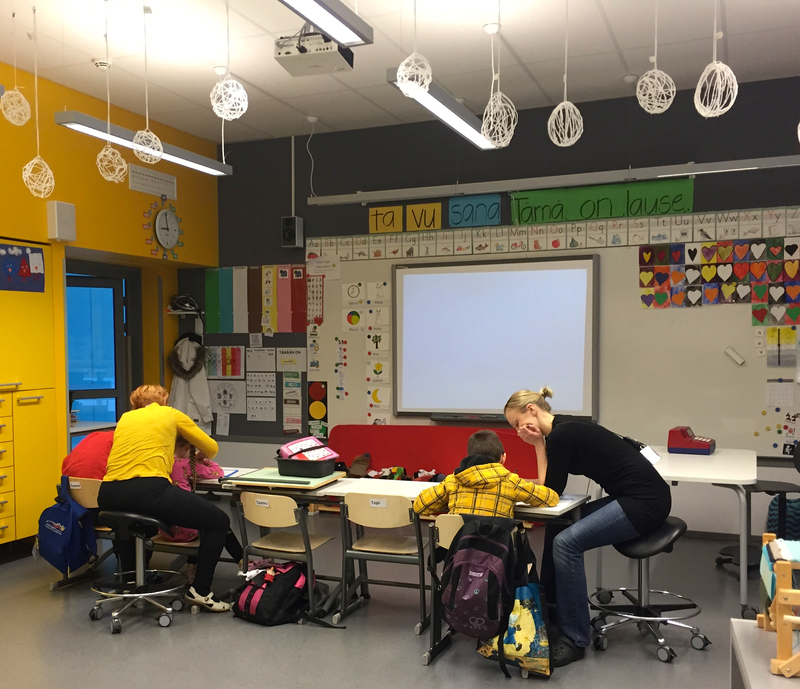 This winter I ventured north from Helsinki to visit Innokas schools in Rovaniemi and Oulu. 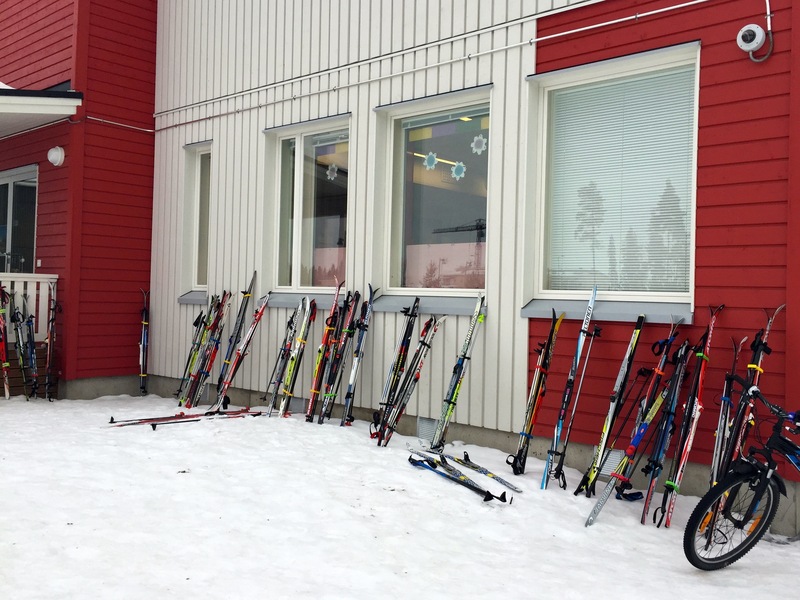 Upon arriving at the Metsokangas School in Oulu, the first thing I noticed were the skis. It looked like I might be at a cross country ski center in Vermont. But then I saw the bikes. I’m 100 miles (160 km) south of the Arctic Circle, and kids are biking to school in February. Wow. It was quite a warm day, hovering right around freezing, but most bikes in the US at this time of year are stored in garages or basements, covered with a layer of dust, and in need of a tire pump. Most American elementary school students don’t even bike to school when it’s warm out. And the streets and sidewalks in Oulu were were sheets of ice flanked by huge snow piles. This entry was posted in Uncategorized on April 10, 2015 by Travel Stitcher. Despite studying Finnish for over a year, I had never learned the word piiri, which translates to “circuit” or “circle.” During my trip to Lapland to visit the Ylikylä School in Rovaniemi, I became familiar with both translations. Arriving during the weekend, and armed with a rental car wearing studded tires, I had the opportunity to be a tourist. On my way from the airport to town, I made the mandatory stop at Santa’s Village. I finally figured out that all the signs for napapiiri were not directing me to a town of that name, but rather to the Arctic Circle. My original plans didn’t include dogsledding, thinking it to be the touristy Lapland equivalent of a Central Park carriage ride. But another Fulbrighter highly recommended it, so I decided to give it a try. I’m mighty glad that I went, especially as I had the sled to myself and got to drive for the whole 2 hours through snowy forest. I am an American teacher spending four months in Finland on a Fulbright grant, and I recently had the opportunity to spend a week at the Koulumestari School. I observed several different classes, but I spent the most time with one sixth grade class. 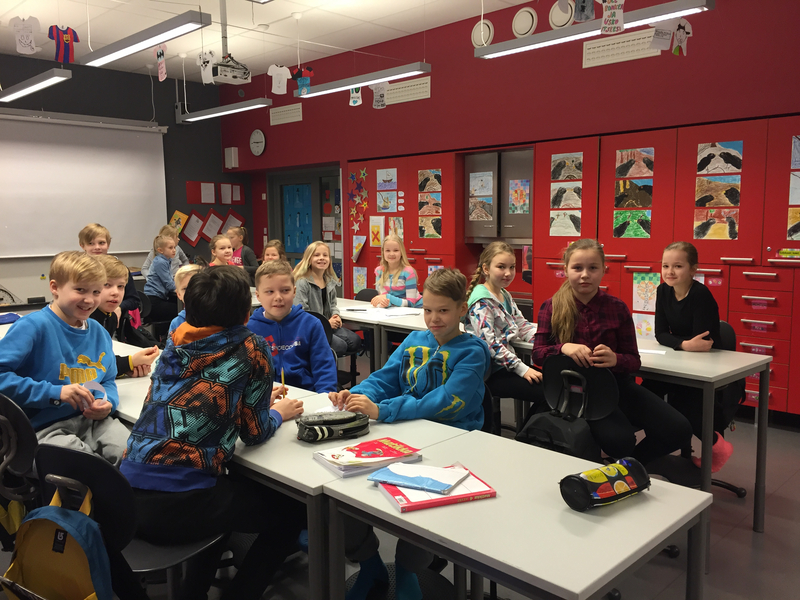 I have my own blog to keep track of my observations as I visit schools throughout Finland, and I was asked to write a guest post for the Innokas blog. My first impression of the school was that the atmosphere was less stressful and more relaxed than a typical American school. This was evident when seeing students remove their shoes upon entering the building. Not only are the floors clean enough for sitting, but wearing socks or slippers while learning must make students feel more comfortable and as if they are at home. A typical day for the 6th graders at Koulumestari starts at 8:15 with some greetings said by the class in unison, both in Finnish and English, followed by a run-down of the day’s schedule. Then they have two 45-minute classes, followed by a 30-minute break during which they go outside to run around and expend extra energy. Students then return for two more 45-minute lessons. Next is a 20-minute lunch and another 30-minute recess outside. The afternoon schedule varies, with classes usually ending at 2:00 (3:00 on Tuesday). This entry was posted in Uncategorized on February 21, 2015 by Travel Stitcher.